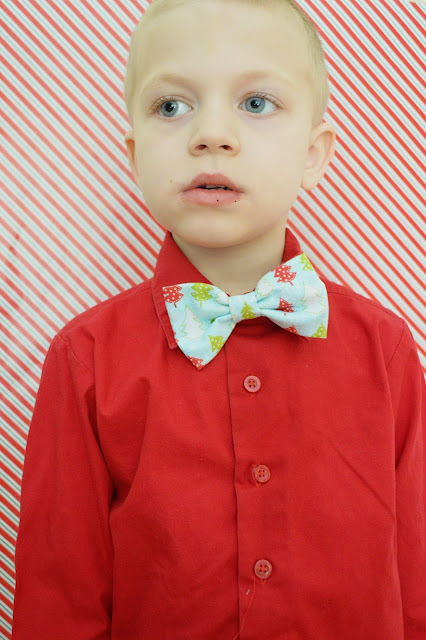 If you're looking for accessories for your little girl- all you have to do is take a quick look around Etsy and you will be overwhelmed by all the adorable options out there...but when it comes to boys (especially slightly older boys like my son), it seems the options are much fewer! 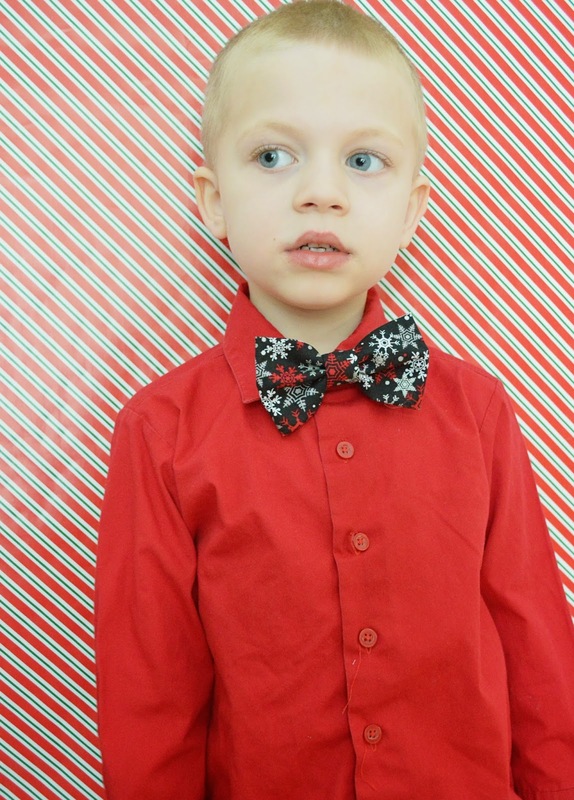 So for today's Holiday Gift Guide review and giveaway, I'm excited to share with you an adorable little Etsy shop that has a little something for the boys as well-MudPuddles & Ruffles. A few weeks back, I shared on my personal Facebook that Shaun had insisted on wearing holiday themed clothing to school, but that his selections were limited. That's when I was contacted by a friend of mine and owner of MudPuddles & Ruffles asking if we'd like a few holiday bowties for my little man to review. I was thrilled! After taking a look around her shop, I was immediately in love! She offers a little bit of everything- bowties, banners, handmade crayons and more...but my favorite were certainly the bowties! We received two for review and they are both ADORABLE!! The bows we received were both pin-style closure, but they can be purchased in alligator style clip as well. The pin style were perfect for Shaun at six years old, but with a smaller (more wiggly) child, you might find the clip style to be a better option. I love how easy they were to use and that they could really be worn with any top. They are beautifully made with lots of fun color options to choose from- both holiday and not. Don't see a print you like? Ask about custom orders! The possibilities are endless. Shaun and I both love his new bow ties- how handsome is he!? We also received a sampling of some of the fun handmade crayon options available. 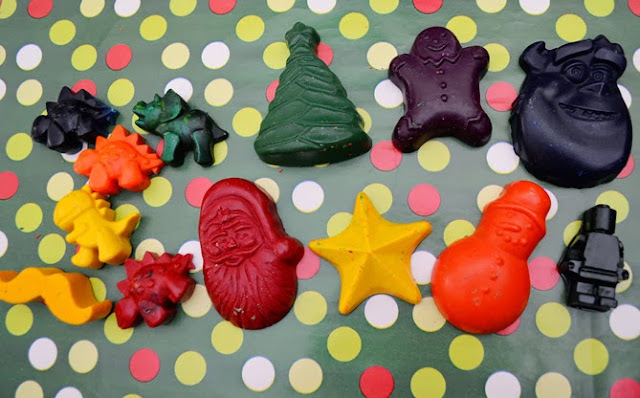 These are recycled crayons formed into a variety of fun shapes. With my son's love of Christmas- the holiday shapes are sure to be a hit, but all are absolutely adorable and great quality. These are ideal for stocking stuffers or party favors for your little one...or even just because! 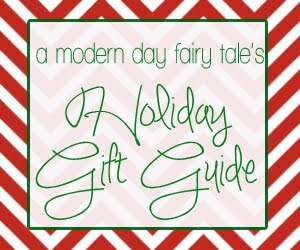 And one lucky reader will win a $20 gift code to spend on anything in the shop! Will you buy a bowtie? Some crayons? Enter using the Rafflecopter form below. I'd get the Marvel Comics bow tie.